It’s that time of year again when we make lists of preservation accomplishments and failures. We’ll get started with the historic properties that were designated as Mississippi Landmarks in 2017. The Mississippi Landmark designation isn’t the same as National Register listing, and to read about the differences, see last year’s post. Compared to the plethora of new designations in 2016 (22, which was a record, at least since we started keeping track in 2009), this year’s list is much shorter, composed of only 7 properties, one of which (Dockery Farms) has 8 buildings. 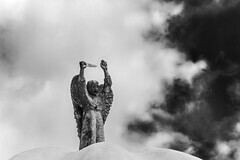 Several photos below and the accompanying text came from the Significance Reports prepared by staff in the MDAH Historic Preservation Division for review by the MDAH Board of Trustees. Located in the center of the Smith Park Architectural National Register District is Smith Park, the only “public square” to be established in accordance with the original checkerboard plan drawn by Peter A. VanDorn in 1822. According to William McCain’s Story of Jackson, President Thomas Jefferson had suggested the system of alternative open spaces to Governor W. C. C. Claiborne as a convenient and salubrious design for a proposed town. Although Van Dorn’s plat shows a large number of such greens, all the others were eventually sold off for development until only Smith Park in square 12 remained. Established as a park on February 16, 1838, the block remained little more than a grazing area for animals which wandered freely throughout the city, until 1884 when a fence was erected to protect the space and give it a more park-like appearance. 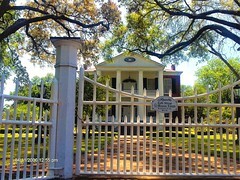 James Smith, a Scottish industrialist who had operated furniture and hardware stores in Jackson from 1834 until 1850, donated $100 for the fence, and his name has been associated with the park ever since. Through the years, elements have been added to Smith Park including monuments, bandstands, and a pavilion believed to be part of the “beautification and development projects of municipal buildings, parks, and playgrounds” during the Works Progress Administration period. From 1973 to 1975, substantial alterations were made to the park under the direction of City Engineer Rick Griffin that included a large fountain in the northeast corner feeding a concrete stream that winds through the park and under sidewalk bridges, terminating in the southeast corner. The mounding of earth at this time created various elevations in the park. A more circuitous sidewalk system, designed for lingering rather than efficient movement through the park, was also introduced. The greatest architectural integrity within the park is associated with the ca. late-1930s Catahoula-stone pavilion, the Order of the Eastern Star monument, and the W.J. Davis pergola monument. Smith Park looking south toward Governor’s Mansion. The dry concrete river and the bandshell, built in the 1970s, were not included in the landmark designation and the river is currently being demolished. Photo Jan 2017 by Barry White, MDAH. Sedgewood is a fine and particularly well-preserved/restored example of a Greek Revival planter’s cottage, constructed circa 1842. Its architectural significance is derived from its believed design by British-born architect William Nichols, who also designed Mississippi’s “Old” Capitol, as well as three other state capitols and the Mississippi Governor’s Mansion. The house’s interior is notable for its early eclectic combination of Greek and Gothic Revival decorative detailing. Additional significance is derived from the large percentage of the original plantation’s acreage remaining intact today. This sprawling Modernist campus, opened in 1957, consists of a large administrative building at the front, housing a gymnatorium and cafeteria, and three flat-roof classroom wings extending to the rear. The campus, designed by Meridian architect Bill Archer, was built by Columbia/Meridian contractor Polk Construction Company and was the result of the Mississippi Equalization Program, passed in special session in November 1953. Originally known as South Side High Schools, it was the only high school for African American students in Jasper County, outside of Bay Springs, until de-segregation occurred in 1971. Berry Elementary School (originally South Side High School), Jasper County. Photo Ocr 28, 2016 by Jennifer Baughn, MDAH. Greenwood City Hall was built in 1930 and features terra cotta stylistic elements associated with the Art Deco movement of the early-mid 20th Century. The building was designed by noted local architect Robert J. Moor and originally housed all of the functions of the City of Greenwood including administration, the fire department, the police department, and the city jail. Greenwood City Hall is a contributing element to the Greenwood Commercial and Railroad National Register District. There have been some alterations to the interior of City Hall which include the addition of some wood paneling and dropped ceilings in many rooms; however, the original layout of the building is highly intact. Exterior renovations and maintenance have been sympathetic overall to the historic character of the building and it retains a high degree of architectural integrity. This house is significant as the home of Dr. Jane McAllister (1899-1996), a nationally renowned professor who was the first African American granted a Ph.D. from Columbia University when she finished her Education degree in 1929. She was only the sixth black female to receive a Ph.D. in the United States and was the first African American woman in the United States to earn a doctorate in education. She received her undergraduate degree from Talladega College in Alabama (1919), a Masters degree from the University of Michigan (1922), and a Ph.D from Columbia University (1929). Dr. McAllister later taught at Fisk University, Virginia State, Morgan State, Hampton Institute, Miner Teachers College and Jackson State University before retiring in 1970. Dr. McAllister’s sister, Dorothy McAllister, was a well-known librarian at Howard University. McAllister House. Photo Jan 17, 2017, by Jennifer Baughn, MDAH. The Dockery Farms complex–eight historic structures clustered on the north side of Highway 8 adjacent to the Sunflower River–is of exceptional national (and international) significance in the area of music. 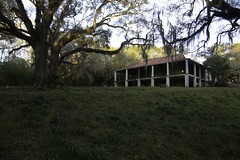 In addition, Dockery Farms represents a significant and intact cotton plantation headquarters. Dockery Farms, established in 1895 by Will Dockery (1865–1936), eventually supported over 2,000 workers on its far-flung cotton fields. Charley Patton (1887-1934), one of the most notable figures in the early history of Blues music, resided here from the age of 10. Another noted Blues musician Chester Arthur Bennet (a.k.a. “Howlin’ Wolf”) (1910-1976) lived here in his youth, between 1923 and 1933. 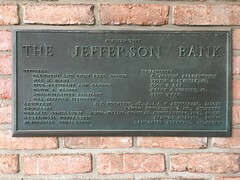 This one-story, wood-frame, former school building was built in 1921-1922 with assistance from the Julius Rosenwald Fund, which donated $1000 of the $3,800 cost of the building. The school closed in 1963. 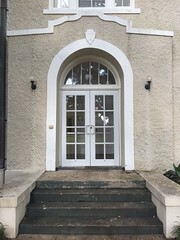 In the summer of 1965, it reopened as a Head Start under the management of the Child Development Group of Mississippi (CDGM), but this closed in the spring of 1972. The building has since been used for storage by the county. This is one of only about a dozen surviving Rosenwald schools in Mississippi. The Julius Rosenwald Fund was begun at the request of Booker T. Washington in 1912 and was the gift of the CEO of Sears, Roebuck Co., Julius Rosenwald. The Rosenwald program was the only philanthropic effort in the early 20th century to concentrate on improving the learning environment of black students in the South. The building is a variant on the standard Rosenwald Plan #3-B, which was designed to face north or south and have three classrooms plus an industrial room. The original windows were probably 9/9 wood double-hung sash, but these were replaced c.1970 with 1/1 aluminum-frame windows, probably at the same time that original clapboard or drop siding was replaced with the current Masonite panels. While the exterior has been altered, the interior is highly intact. Isaac Chapel Rosenwald School. Photo by Jennifer Baughn, MDAH, November 16, 2016. It seems like there is a comparably high percentage of privately-owned houses/plantations in this year’s batch of landmarks. Since the MDAH Board of Trustees always seems loathe to designate any public property against an elected official’s will, I would guess that the owners of these houses sought the designation, which bodes well for their preservation. Will we be getting a post on buildings the Board declined to designate as Mississippi Landmarks, or were there none of those this year? Yes, you’re right, and I’ve mentioned that growing trend on past Mississippi Landmark posts but forgot to this year. Although there are several public properties in this year’s list (Greenwood City Hall, Berry Elementary, Isaac Chapel), the Smith Park designation is the only one that was “controversial” in the sense that it wasn’t initially requested by the owner. I believe that in the end, though, the City of Jackson did request that it be designated. Perhaps that came with the understanding that the concrete river and bandshell, installed in a major 1970s renovation of the park, would not be included in the protective designation, and I for one am sad to see those features be demolished. I think they’re the best thing about the park and just needed to be maintained or, in the case of the river, repaired and perhaps given a liner to reduce the problem of water loss. 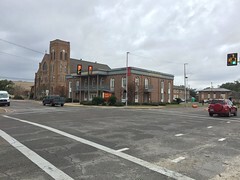 It seems to me that would have cost far less money than the $2.5 million price tag Downtown Jackson Partners is proposing for the project that MDAH approved and is now underway. Chester Burnett. Also the nome de plume of the ubiquitous book review critic on Amazon who shows a distaste for Southern writers by writing scathing reviews of their literary works. His latest critique is aimed at the USM’s Chester Morgan biography, Theodore Bilbo: Redneck Liberal of the New Deal.